Many iPhone owners are reporting yet another Daylight Savings Time bug, this time some iPhone clocks chose to ‘fall back’ an hour rather than “springing forward” like they are supposed to. Following those instructions your iPhone should correct the time itself, but you may want to set a backup alarm tonight just in case the bug persists. The iPhone has inexplicably been plagued by multiple daylight savings bugs over the past year, each time sending the iPhone-dependent internet into an uproar as alarms go off late or early. The picture above (via @catone) shows the problem affecting a user in Texas. iPhone 4 here and it got me, it’s a Sunday so I don’t really care. I’m more concerned about it returning tomorrow morning. Got me here in Texas as well, on an iPhone 3G. The phone actually correctly changed the time last night, and then changed it back while I was asleep. Mine did the exact same thing here in Toronto. I’m in the pacific time zone with an iPhone 4 and it did the same thing to me. Adjusted fine yesterday (Sunday), but then made me late to work today when it decided to go back off DST during the night. Mine did the same thing here in Austin. It fell back overnight causing me to be an hour late. Boo! No issues here, iPhone 4 and iPhone 3G both on AT&T with 4.3 and 4.2.1. I’m in Pacific Standard Time, seems like other time zones are more prone to the bug. Either your article is wrong or your photo is wrong… The article claims that the phone went “backward” instead of springing forward. If this were the case, the time would be two hours different, not one hour. Like others are reporting in the comments, my iDevices adjusted correctly to the daylight savings change. well being that the phone went forward then went backward 1 hour is correct…. No, 2012 here, and my iphone 4s “fell back” from toronto time to winnipeg time, meaning that it stayed the same time, so falling back does just mean that it would be an hour late, and springing ahead would mean that it would be one hour ahead. it’s a goegraphic thing, I think. The fix posted above did not work. No, it didn’t work. Please post another solution to the problem. The iPhone is a piece of crap. My phone hasn’t moved forward an hour. iPhone 4 here. The iPhone didn’t “FALL BACK” it just didn’t move forward an hour, thus the bug now is that iOS does not recognize DST. Clock will be an hour off unless you manually set and readjust as you instructed. I work Sundays. While my *clock* made the change just fine, my recurrent alarms (one to get up, one to leave) crapped out. The 10am (up) didn’t ring at all. The 11:30 (leave) rang… At 10:30. I barely got to work, sans breakfast. I got burned in November too. WTF Apple?!?! It’s a *CLOCK*. I’ve had cel phones since 2000. NONE of their clocks had ANY bugs with DST. DIS-like. My iPhone 4 changed to DST but my alarm is going off an hour early every morning. Does someone have a fix for this? i dont have the 4.2 update so i worked on this since last weekend….finally figured it out. The repeating alarms will work if you sent the alarm time a hour ahead. I get up at 6am so i had to set the alarm for 7am and it worked fine everyday without me manually turning it on everyday. Get it together Apple! Same here, the clock set automatically fine but my repeating alarms rings 1 hour earlier. If I remove the repeatings it rings at the correct time … Go figure ! Same problem as Atlantic-CA. Time was correct on Sunday but reset itself overnight to an hour early. Turning on then off Airplane mode fixed it. I don’t know is it is because I upgraded to 4.3 but, I have had no problems with my iPhone 4; the phone automatically changed the time and I have had no problems. I connect my phone every night to charge just before going to sleep and turn it off then turn it back on the next day and no problems. I have an iPhone 4 in Oregon and the stupid alarms went off and hour early! This is exactly what is happening with my iPhone 3G, and my boyfriend’s iPhone 3GS. We live in Missouri, and the alarms go off an hour earlier than they are set to, even though the correct time is displayed. I’m worried that I’m going to have to update to fix this, and I can’t update since I have a powerbook G4. Without buying a new computer that is intel-based I am stuck not being able to update anymore. Is this Apple or Microsoft? I can’t tell anymore . . . Considering that Windows Phone 7 devices did the switch flawlessly, and considering that Apple has known about clock issues for… what now, months? years? I would say that your comment about Microsoft is rude and silly. It’s 6:30am, I should be at work right now and am instead just waking up because my iPhone says it’s 5:30, who the fu is going to compensate me on this? 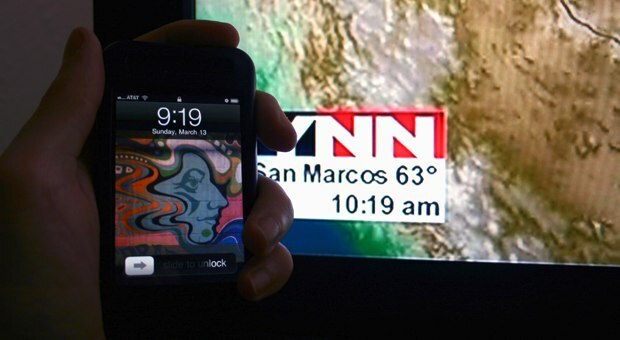 my iPhone 3GS seemed to show the correct Daylight Savings time on Sunday but fell back an hour this morning (Mar 14). I’m in PST so I dont know if the theory that its mostly other time zones is valid. My phone actually sprang forward, and then last night went back, so it did go back one hour. Very weird….but it made me miss the gym! Boo!! My Seiko Kinetic switched over just fine. iPhone – Sometimes an advancement is a step back. Happened to me here in BC,Canada. Phone sprung forward on Sunday, then fell back Sunday night. Reset the time Monday AM but it switched back again. Putting it in and then out of airplane mode has seemed to help…so far. I’m glad to see that I’m not going nuts. My iPhone 4 made the switch yesterday (in Washington State), then I set the alarm and went to bed. It reverted back sometime overnight and I woke up an hour later than I planned. I did the Airplane mode on/off thing and it fixed itself. Now we’ll see what happens tonight. BTW… My wife’s 3GS running 4.1 was fine. Well my scheduled 545 alarm went off at 445 this morning! My alarm was clearly set for 545 but at 445 when I looked at the clock my alarm is going off. I thought well maybe it will go off again at 545….NOPE Thanks Apple, I thought we were past Y2K, you can’t get a stupid “smart” phone’s alarm to work? Oh and yes, this is the not so wonderful 4G phone, so what’s your excuse now Apple? Though I should have know, because New Year’s was a lovely joke on me too. The same thing happened to me. My iPhone 4 changed time to DST correctly but my alarm ringed at 6:30 even though it was set to 7:30. Now all my alarms which are set with repeat don’t work, only alarm set without repeat function work correctly. I did multiple restarts, switched to airplane mode on and off, deleted and created new alarms from scratch, nothing helps. My phone is running on 4.1 firmware. I guess I need to upgrade to 4.3 to get this fixed. Can anybody confirm that 4.2 or 4.3 firmware got this fixed? This is exactly what mine keeps doing. I’m going to try the fix above, but I’m not holding my breath. This is silly. A clock is not rocket science. I feel your pain Audrey. It is such a cruel joke. I am from Japan, yesterday I scraped up what was left of my children and put their remains in a box that I’m keeping with the rubble that used to be my home. I am not sure where to bury them since everything is destroyed and currently under nuclear radiation… and then to top it all off… MY iPHONE DIDN’T AUTOMATICALLY UPDATE TO COMPENSATE FOR DAYLIGHT SAVINGS TIME! I HAD TO DO IT MYSELF!!!! DAMMIT! My iPhone 3G running iOS 4.1 adjusted the CLOCK correctly, but repeating alarms are not going off at the right time. Non-repeating alarms are fine. As I recall from last fall, the problem resolves itself in a day or two. Note that the steps above did NOT fix the problem, but then my problem is with repeating alarms, not the clock itself. My 3GS did update the time fine but on Monday morning the alarm I had set for 6:30 am went off at 5:30am so I had the opposite of many being woken an hour earlier instead of late. Another sleeper aroused an hour early. My alarm (recurring, and set after change to Daylight Savings Time) was set for 5:45, but my iphone4 went off at 4:45. I haven’t explored whether this will occur with nonrecurrent alarms. I was warm & snug in bed, & now I’m groggy & disgruntled. My friend and I both have a 3GS iPhone.. Mine wasn’t affected, but her alarm kept going off an hour early. The only thing i could think of was that I had updated the software Thursday or Friday night so maybe that corrected the bug? Same here as Jonathan and there seems no fix for it. I tried many options. Mine sprung ahead just fine on Sunday, then for no reason it fell back to MST, all of my alarms are a hour early, and the only way to get the phone to show the right time is by manually setting it. C’mon it’s a clock for goodness sake!! I have an iPhone 3G with AT&T. My time changed just perfectly with no issues. What *is* weird is that my recurring alarms keep going off an hour early. So when my iPhone says “7:30”, and my alarm is set to “7:30” it goes off at 6:30. I tried several recommended solutions (including the one above) and the only one that worked: going through all of my alarms and adding 1 hour to the times. They go off perfectly on time (so when I set it at 8:30, it still goes off at 7:30). same here. my husband and i keep thinking we got it fixed and then boom one hour early the alarm goes off, again. we have lost an hour a nights sleep since the time change. So nobody is ever supposed to be annoyed by anything, beause there is always some tragedy happening somewhere? My jailbroken IOS 4.1 3GS correctly updated it’s clock, but my weekday repeat 0730 alarm keeps sounding at 0630! Grrrr. Exactly the same symptoms as Shelly describes above. i “had” a jailbroken iphone4 the only way i got rid of my clock/alarm clock problem was to update :( now im controlled by the man again over a stupid alarm clock. I have a 3GS here in PST, alarm is going off an hour earlier than set time after the change. I had the same issue when we pushed the clocks back last year. Tried that “manual fix” in the article and it did not work! Now I have to delete and recreate all of my alarms or set them an hr forward. Either way its a pain in the a**!! Got me as well iphone4…i had an alarm set for 7:45am befor the time went forward And now my alarm goes off evry morning at 6:45…even if i delete the alarm VERY ANNOYING! Bogus report. Not all iPhones (if any) failed to “spring forward”. My iPhone 4 sprung correctly. My wife’s iPhone 3Gs sprung correctly. My wife’s iPad 1 sprung correctly. The preset alarm triggered an hour late, but the phone clock was right on the money! im in florida and my iphone did the same thing but i had it set to 645 and it kept going off at 6 umm thats not even the right time!! grr and thats what wakes me up in the mornings very aggravating!! iphone 3g clock change to dst (spring forward) but alarms are now going off and hour early! I have the latest os4 on phone, wishing i just left it alone now. Have tried all the latest fixes but still nothing! Why can’t they fix this issue? Is this going to happen every time we change from dst? Time correctly changed with DST but my repeating alarm triggered an hour early. Wife’s phone is fine why is that? My alarm doesnt work!!! It goes off an hour early now. Anyone know how to fix this??? I am very upset…. happened AGAIN today… still doesnt work. mine too!! and even yesterday! the clock went 1 hour earlier (or later whatever) but the alarm rang 1 hour earlier that’s for sure, well better than later but it’s bad anyway. My iPhone 3G was late 1 hour this morning, so rather than going back with just 1 hour it went back 2 hours so I almost missed my Appointment this morning, thanks to my baby who woke me up. Ok i have the HTC EVO 3D and i had this problem Sunday..I had my alarm set for 530 and my alarm went off and my phone said 430 so I figured I had an hour of sleep that just the alarm didn’t change..I get up and out the shower get a phone call from work while still looking at my phone it said 6 and then when I hung the phone up it switched to 7am..anybody else have a problem like this with their EVO?? Happened AGAIN. March 11, 2012. DST reverted back after I unlocked my phone to view email. Nice. This is PATHETIC. The fact that its not FIXED is ABSURD. The largest company in the world cant even keep time. Reports of iPhone 4S failing are coming in now too. Its so simple to tell people to “upgrade technology” isnt it. Well, maybe it should have worked all along. I am LAUGHING at the lack of brains. I did the fix written above and it displayed the correct time before I rebooted. After reboot I changed “Set Automatically” to “On” and the clock jumped back an hour again. I forgot to mention in my earlier post that I have a iPhone 3G, not GS or 4 or 5 oops 5 isn’t out yet. Well the 3 G isn’t upgradable to iOS 5 and I’m not about to upgrade to an iPhone 4 just to get the correct time. I got my money’s worth out of this 3G so I’ll likely upgrade to a iPhone 5 when it comes out or maybe an Android. The clock on my son’s Android works fine. I didn’t have a problem with the clock updating, but I’m getting the same same alarm clock bug as last year. For alarms set as “every day” the alarm goes off one hour early (so if set at 6am, goes off at 5am). Not appreciated by the sleeping baby, nor my wife. The quick fix is to not use “every day”, but what gives?